Jigsaws are amazing tools for smoothly cutting tight curves into thicker material such as MDF, plastics, plywood, and most other similar materials. Jig saws are pretty affordable, for the most part. That’s why these projects are perfect for beginners who might be unfamiliar with jig saws. They are also pretty fun for professionals as well. Not only can you find pallets for cheap (sometimes free) online in your local community, but pallet shelves are also amongst one of the easiest and most popular projects for using jig saws. All you need for this is a pallet, sandpaper, a 5/8″ wood screw, paint, and stain, and a 1/8″ drill bit. The tools you will need include a drill, a jig saw, a hand saw, an orbital sander, and a paintbrush. You can check out a full tutorial here to get a better idea. Surprise! This doubles as a serving tray! Just keep it out of the dishwasher. Tools you will need for this are a jig saw, a cordless drill, orbital sander, forstner drill bits, a miter saw, tape measure, and safety goggles. (We like our eyeballs, so let’s keep them where they belong.) The materials you will want to use are 3/4″ x 3/4″ diameter dowels (four of them), 20″ x 3-1/2″ maple boards (three of them), 23-1/2″ x 1/2″ x 3/4″ walnut strips (two of them), and 5″ x 1/2″ diameter dowels (two of them). For step-by-step directions, check out these instructions. Yes, I had to add in something a little more creative. These are a lot of fun to make and don’t really take up a ton of time. Not to mention, you can make create a lucrative business out of doing this kind of thing (just like the crafts store, Michael’s). All you need is a miter saw, a jig saw, wood pallets, paint, a sander, wood glue, and a piece of 1/4″ luan plywood. The paint is optional but if you’re interested in turning this into a fun family project, you could all partake in the painting portion together. For the full list of instructions, look here. Hear me out. This might sound crazy but making a giant wooden jigsaw puzzle with a jig saw has its own ironic charm. All you need is plywood, a ruler or a tape measure, a jig saw, a sander, sealer, paint, and a pencil to trace your puzzle onto the plywood. This is, in my opinion, the easiest project anyone on a budget can do with their family. Aside from the dozens of YouTube tutorials, it would be a good idea to check out actual directions, which can be found here. With that being said, it is important to research the top jigsaws on the market. Making sure that the tools match the requirements for your chosen project is the only way to ensure that your project will be completed properly and efficiently. 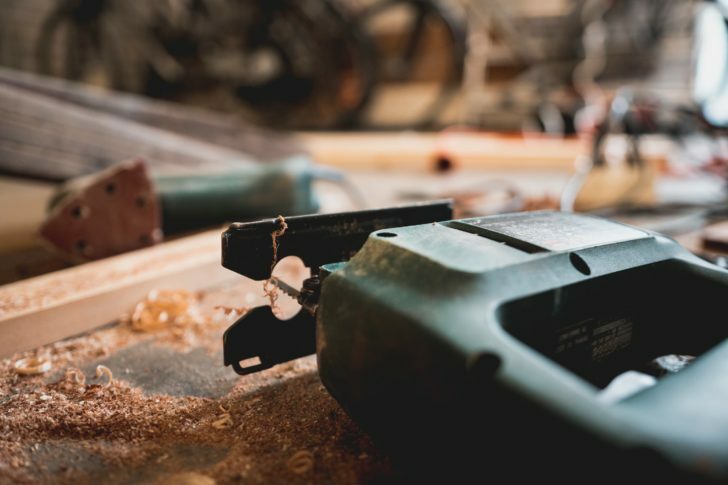 The best way to figure out which type of jig saw you need for your project is to either talk to somebody at a local hardware store or check out some reviews online. You can find a pretty decent list here to help you. The top three that are listed on Amazon right now are the Black+Decker (BDEJS600C) Smart Select Jig Saw, the Black+Decker (BDCJS20C) 20V Max, and the Dewalt (DCS331B) 20V Max Li-Ion. Be sure to read comments, comparisons, prices, and descriptions. On another note, you will definitely want to make sure the blades that you have are of exceptional quality. Blades that aren’t quality blades don’t usually last very long. Hope this helps in your current and future projects!